Shallots fall somewhere between vegetables and condiments; one can make onions a dish unto themselves, but it’s hard to imagine serving shallots as a distinct dish (though some include them whole in stir fries). Whatever, they are a cooking, and thus gardening, essential. In reality, a shallot is (as its “scientific” name, Allium cepa, suggests) just a special kind of onion—one with “more interesting” flavors (as one source puts it) than standard bulb onions. They are best and most productive fall-planted for overwintering (best with at least some protective mulch) with harvest the following autumn. There are two types of shallots: the gray shallot and the pink, or “Jersey” shallot. The former has a long bulb covered with thick gray skin, from which it gets its name, and a white/purplish flesh. The latter is divided into several types all having a copper tint including long shallots, with yellow or purple bulbs with a strong flavor; half-length shallots, pinker or redder with a fruity flavor; and round shallots with a mild flavor. Many aficionados hold that the gray is the only “true” shallot, but—as you see—even the French are not adamant on that distinction. The gray is commonly held to be somewhat better for culinary purposes, but its drawback is that it is not a long keeper—quite the contrary (two or maybe three months maximum)—whereas the red (or rose or pink) kinds usually are long keepers, good for possibly up to as much as a year in ideal conditions. The gray is hard to find in the western hemisphere; most seedsmen just offer a yellow and a red, however denominated (“Dutch yellow” and “French red”—reportedly the most common dry shallot grown—are common). The gray is claimed to actually be a distinct species: Allium oschaninii. The “Dutch yellow” may be the dreaded seeded shallot (dreaded by the French growers who believe that only a vegetatively propagated shallot has real shallot quality). The difference between a multiplier onion and a shallot is somewhat arbitrary, and they are often lumped together. Commercially however, those with yellow or brown scales and white interiors, such as the ’Dutch Yellow’ type, are usually classed as multiplier onions, while those with red scales and, supposedly, a distinctive and more delicate flavour, are classed as shallots. As you see, which is what gets complicated and is somewhat subjective (and often heated). A link farther down this page by a woman who now lives—and cooks and shops—in France, distinguishes, like the quotation above, between gray and red “Jersey” shallots, which latter come in the shops as long and “half-long” types. Whether those are the same as the often-encountered “French red” of seedsmen’s catalogues is hard to say for sure (but it seems likely). It is said that shallots can successfully be grown in containers, very possibly even indoors; the problem there is that if your planting doesn’t work, it takes an awfully long time to discover it. Still, it’s probably worth the effort to have a continuing supply of the true French shallot. Note that shallots are close cousins—arguably sisters—to “potato onions”, discussed here on our main onions page. Shallots are normally grown from small starter shallots: there is now true seed available, but it is all hybrid (and so replanting the resultant bulbs may—opinions seem to differ—produce off types), whereas once you get shallots growing in your garden, you have them forever by just saving out a small part of each year’s crop as next year’s starters. In our opinion, it would be fatuous of us to set forth the somewhat complicated and detailed instructions for dealing with shallot-growing when an excellent set is already available on line. 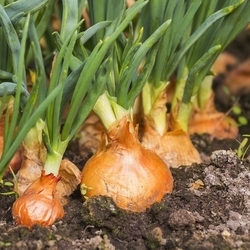 Here is a link to the on-line page How to Plant Shallots from WikiHow (note: in a deep-dug bed, you can use 4" spacing, or 6" if you’re conservative). But that information, copious as it is, still leaves the gardener one other decision to make. That decision is how much seed shallot (meaning bulbs) is wanted for the number of plants to be grown, for seed shallots are sold by weight, not count. A pound of seed shallots is said to plant 15 feet in a row at a spacing of 4 to 6 inches (that is, 2 or 3 to the foot), which translates to 30 to 45 plants to the pound; for a first season, it is probably as well to be conservative and use the figure of 30 to the pound. You can harvest shallots at any green stage you like and they are delicious that way in salads. Otherwise, harvest them like onions (which, in essence, they are) in the spring following your planting them. Shallot Varieties for the Home Garden - a medium-long list of varieties, with short descriptions. Shallots are a variety of that general class we call “shallots”, which all are members of the Alliaceae family, the alliums (till recently called the Lilliaecae family). Besides such obvious relatives as leeks, scallions, and garlic, the shallot’s kin also include lillies and hyacinths. Shallots are apparently not found anywhere wild, and so must have originated through human breeding from other shallot-family members, They are thought to have originated in ancient Ashkelon, a city in Palestine—where a Ms. Delilah once famously barbered a Mr. Samson—hence their name ascalonicum. There is evidence that they were a common ingredient in ancient Egyptian cooking; certainly they were widely grown in both Greek and Roman gardens. The varieties that we use today are probably more or less the same as those used thousands of years ago. Tennyson wrote a well-known poem, “>The Lady of Shallot”, that has nothing whatever to do with shallots the vegetable, and whose mention is thus always good for a crude, Philistene laugh. It was last modified on Sunday, 3 February 2019, at 01:06 EST.